The path of the Mara River. It runs through both Kenya and Tanzania, including the Serengeti, before flowing into Lake Victoria. Courtesy of Global Water for Sustainability. 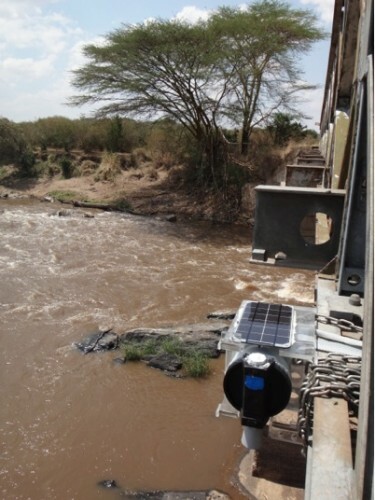 Graduate students working towards improved water quality in the Mara River Basin have formed a partnership with undergraduates to implement new monitoring technology. Amanda Subalusky (Post Lab, Ecology and Evolutionary Biology) and Chris Dutton (Anisfeld Lab, School of Forestry and Environmental Studies) focus on the Mara as one of the only permanent sources of water for millions in the region. The river flows through Kenya and Tanzania before flowing into Lake Victoria, and does more than just provide water to the many people living there. It also sustains millions of species of wildlife including zebras, gazelles and wildebeest in the Serengeti National Park and Maasai Mara National Reserve. The water depth logger can be installed above the river, helping to prevent it from being damaged by floods and wildlife. Courtesy of Amanda Subalusky and Christopher Dutton. Dutton and Subalusky have explored the determinants of water quality and its variability in the Mara River. There is a “master variable” that researchers refer to when studying water quality called the discharge level, a measure of the flow level in a river. “It determines everything, from water quality, to aquatic biodiversity, to bacterial and sediment loads in the river,” Subalusky said. Discharge can be influenced by several factors. For example, when large animals migrate across the river, they bring in organic materials from the land, while aquatic animals like hippos deposit their feces in the river. Moreover, there are humans who take water from the river for their livelihoods and deposit materials such as pesticides and wastewater. Dutton prepares to throw the underwater meter, housed in the protective casing designed by CEID students, into the river. Courtesy of Amanda Subalusky and Christopher Dutton. The Kenyan and Tanzanian governments have passed laws establishing a minimum discharge level, called the “reserve level,” that must be protected to ensure that the ecosystem can survive. 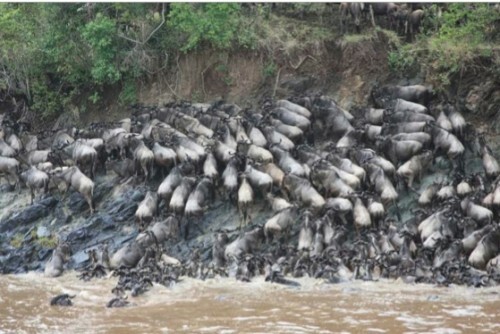 However, with a river as vast as the Mara, it is not easy to measure the discharge level on a consistent basis. 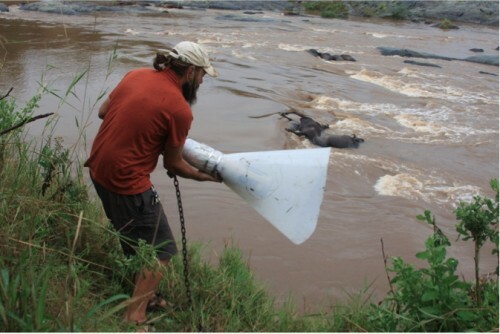 The commercial tools available to measure discharge along the Mara’s route are both very expensive and unreliable in that setting, where they could easily be damaged by frequent floods, large animals, or clogging from sediment and nutrient deposits. Subalusky and Dutton presented these challenges to groups of undergraduate students in the class “ENAS 118: Introduction to Innovation, Engineering and Design” based in the CEID. They worked together to design new technologies that could accomplish the same tasks of monitoring the discharge and water quality that the commercial equipment could — but without having to worry about Mother Nature, errant hippos, or the monetary costs. 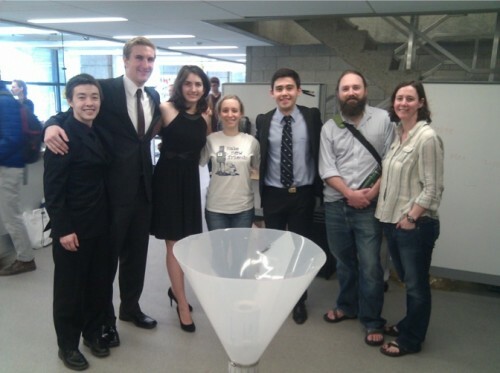 Members of the student group, along with Subalusky and Dutton, with their meter housing design. Courtesy of Amana Subalusky and Christopher Dutton. The students designed two technologies. The first new tool the students made was a protective housing for underwater water quality meters made out of aircraft aluminum and heavy plastic. This design is lightweight and portable but strong enough to shield the meters while they are submerged. The housing includes a funnel-shaped guard to prevent the meter from getting clogged by hippo feces, a modification that is incredibly helpful for Mara River research, but understandably not a common feature in the commercial meters. Wildebeest like these are one example of the large animals that regularly travel across the Mara, trafficking organic materials into the river as they go. Courtesy of Amanda Subalusky and Christopher Dutton. The second tool was a water level logger that provides easily understood and accessible measures of discharge. It is especially useful as it can be installed above the river rather than under it. This is because the logger uses ultrasonic sensors to measure the water level, allowing Dutton and Subalusky to place it under a bridge crossing over the river, away from the dangers of floods and animals. In addition, Dutton made technical modifications that allowed them to upload the data to the internet every 15 minutes, an improvement from the infrequent measures given by conventional equipment. Dutton explained, “We now have real-time data uplinked to our website from one of the loggers in Kenya […] when the gauge hits yellow, you know the water quality is deteriorating. When it hits red, it’s not good.” The real-time measurements are online at www.marariverresearch.org. 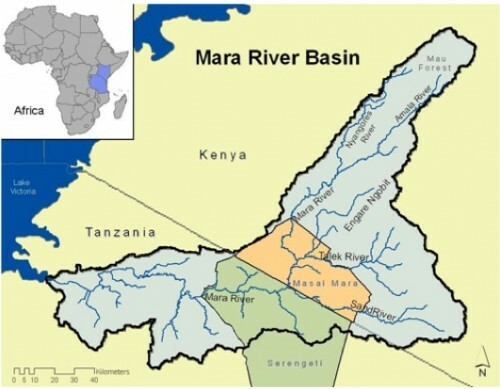 An example of the real-time measurements available on the Mara River research website, marariverresearch.org. Subalusky and Dutton are excited about the new technologies and believe they could make a significant impact on their work. Moreover, their team can troubleshoot the equipment themselves if anything goes wrong, rather than relying on commercial meters with no “customer support” in the middle of the Basin. The cheap, sturdy, and user-friendly designs the students created could have positive effects for other researchers, residents and even governments in the region. “I think creative, low-cost solutions like the ones designed by the students in the CEID class are really the key to improved water resources management in developing countries,” Subalusky said.